Actually, traditional Russian food is very healthy. However, eating habits change as many Russians turn to fast food. Beef, chicken, pork, and fish are popular main dishes. Russian usually eat vegetables include beets, cabbage, carrots, cucumbers, onions, potatoes, radishes and tomatoes. Russians like soups, bread and dairy products, and they also consume large amounts of sugar. Frying remains the most common method of preparing food in Russia. This bread is similar to bread in general but with a different color, namely blackish brown. Russian residents really like this bread because of its taste and benefits. Low in calories with high fiber is an advantage of Darnitsky. In terms of taste, this one bread has a slightly sour taste with coriander aroma which makes this one bread one of the favorite breads in Russia. Almost the same as Darnitsky, wheat is the main material for this bread. So it has a high fiber content and is low in calories so it is suitable for breakfast. White bread is the other name for this bread. This bread has a unique, slanted incision on each side. At first glance, this bread is similar to bacquet but shorter and bigger. Although it has a similar shape, the texture of this bread is different from baquet. The texture of Nareznoy Baton is not too soft and tends to be solid. Therefore this bread is suitable to eat with jam. Kalach is one of the easiest bakeries in Russia. Its unique shape with soft texture is the reason this bread is commonly found in Russia. The shape of the calach is similar to a padlock because it has a curve in upper and round shape at the bottom. From the ingredients and the way they are made, kalach is almost the same as other breads made from a mixture of flour, yeast and sugar. Read also Best Halal Restaurant in St. Petersburg. Blini is a Russian pancake, made from traditional wheat flour or buckwheat flour. These foods are usually served with sour cream, quark, butter, caviar and other trimmings. Traditional Russian blouses are made with yeast dough, and milk, sour milk, cold water or boiling water. Traditionally, Blini is made by baking it in an oven. But today most Russians make Blini fried like making pancakes. The next Russian staple foods that you can eat is kasha. An old saying that you cannot feed Russians without kasha. The main ingredients of kasha is whole wheat. Kasha is have rich vitamin B and rich nutrients including potassium, iron and fiber. 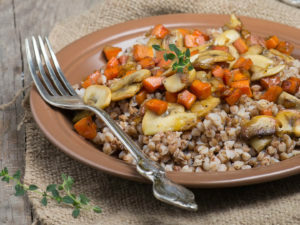 Research shows that a healthy diet rich in whole grains such as wheat content in Kasha. It can help improve heart health and reduce the risk of colon cancer. Do you want to try a pie with a slightly different shape than usual? You can try a Russian pyrog or pie that comes with a flower-like shape at the top. Slices of cabbage, eggs, leeks, apples, and minced beef or pork are filling this pie. For Muslims, you can request pirog without minced pork. So this food includes halal food. Compare to other pancake, this typical Russian pancake has a thicker and denser texture. This pancake uses traditional recipes, with a mixture mixed with buttermilk. Oladyi usually served with salmon roe, caviar, or sour cream and some fruit decoction from juice compote. Kulebyaka is a Russian Pai cake. Its including cakes that are very hard to make. This cake usually contains salmon or sturgeon, cabbage, boiled eggs, mushrooms, onions, rice and dill. But Kulebyaka is also filled with sweet stuff. Kulebyaka can have contents up to 12 layers. In the time of the Russian Empire, the more layers of stuffing, the richer the homeowner.